May gray and June gloom are finally burning off (thank you summer gods! ), and with the sun finally shining all day long, it’s the perfect weather to get to the beach – and really, what better way to spend a fun-filled day with family and friends than when everyone is in “vacation mode” and the kids are out of school? The rest of the summer is calling for clear blue skies and temperatures in the low to mid-80s at the beaches (truly temperate relative to the triple digits expected inland). But getting to the coast can seem a daunting proposition: hauling a cooler, beach chairs, towels, umbrella, packed lunch, sand toys, and the latest beach read: which is why I believe the bungalows at the Pacific Edge Hotel are the best kept secret for the most unique, enjoyable way to experience the surf and sand. Situated steps from the sand along a scenic stretch of Laguna Beach, the Pacific Edge Hotel features five themed beachfront suites, each with its own signature design and atmosphere and characterized by stunning interior decor that includes a comfortable living room overlooking the ocean, a VIP Bungalow Host, a private bathroom with shower, bar area, valet parking, catered food and beverages, air conditioning, flat screen televisions, and a private deck area with direct access to the beach. For our family, getting to the beach in the first place is a bit of a holiday in itself. Having discovered the luxury service of a private bungalow to relax for the day by the waves (and host my husband’s recent birthday soiree with family and friends) seems like a fairy godmother granted all my wishes at once. Typically, hotel beachside service includes a branded hotel umbrella, chaise lounge, mai tai, and some toys for the kiddos. 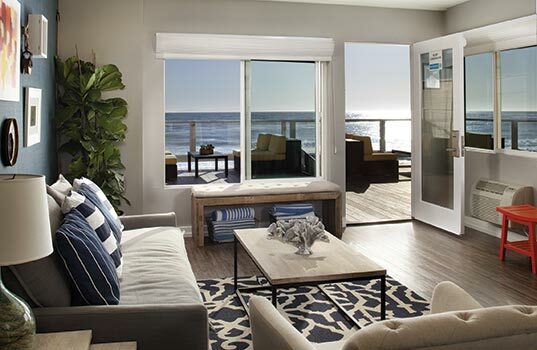 Pacific Edge has taken the concept a entirely new level. The hotel itself, set on the South Coast Highway, is just a mile and a half from the shops and art galleries in Laguna Beach, and twelve miles from Newport. Working with Billabong, Fox, Sailor Jerry and Gorjana + Griffin, the hotel designed a series of signature bungalows perfect for any type of gathering: corporate meetings, birthdays, engagement parties, rehearsal dinners, or even just the perfect “day cation.” New to the lineup is the XS Bungalow, also known as the COF, or Center for Optimal Fun. Designed to give guests the best of both adventure and opportunity, the Bungalow has partnered with the Eco Warrior foundation, offering surf lessons, snorkel and free dive tours, mountain biking, hiking, and Stand Up paddling. After a long day of adventuring, what better setting to relax at than your private deck with a cold XS cocktail in hand? If you just can’t see outdoor adventure and relaxing beach day going together, try the Billabong Bungalow. My favorite of the five, offering a soothing color palette and laid back beach vibes, is the perfect spot to grab some sand and laze the day away. 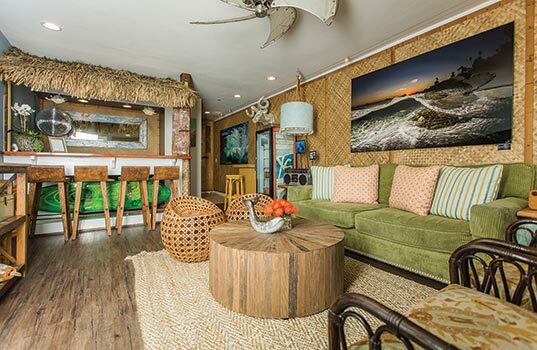 The reclaimed wood accents and epic images of surfers riding waves on the walls certainly add to the ambiance, making the bungalow the most divine daycation yet. With five bungalows to choose from, there’s something for everyone: the day we were there, an entire extended family were on hand in honor of their matriarch’s 80th birthday; a group of motocross racers and enthusiasts were celebrating a recent win; even a band of boys (men who went to high school together 20 years prior) were gathered for a day in the sun that was “reminiscent of a grown up version” of their childhood man fort. 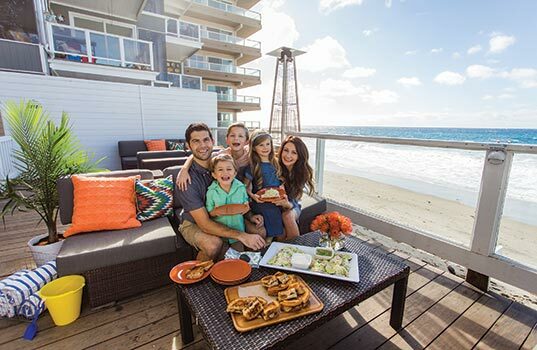 From glamorous Gorjana + Griffin to the fierce Fox Head bungalow, summer is waiting for you at Pacific Edge. 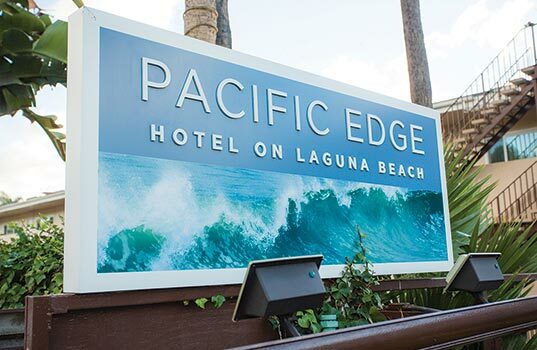 For more information, visit www.pacificedgehotel.com or call (949) 281-5709. 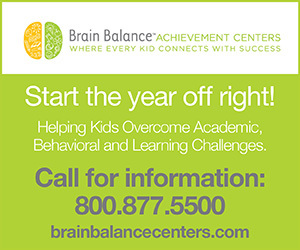 Jody Robinson is mother to two young children and in her “spare time” she publishes five magazines that are distributed throughout Orange County: Marmalade Magazine, South County Magazine, HB Magazine, Newport Mesa Magazine and Orange Magazine. Jody resides in San Juan Capistrano.